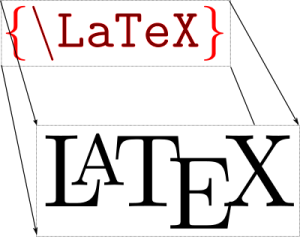 TeX is a computer program created by D. E. Knuth for typesetting documents. It combines a properly prepared text file and the TeX mark-up language to create a typeset document suitable for many kinds of printers. Word processing applications offer many conveniences, but they fail users seeking greater quality and flexibility of control. 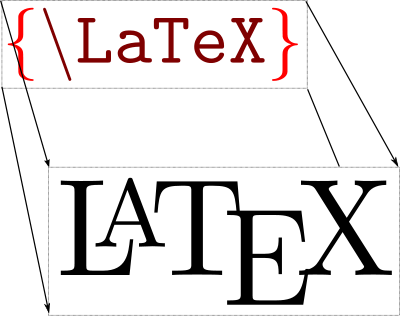 Many well-established publishers use TeX to typeset books, mathematical journals, and newspapers. , written by L. B. Lamport, is one of sevral dialects of TeX. Macros and code packages come bundled with , or can be imported from open-source archives. The macros and packages deliver new operating efficiencies for document layout and production. Examples of enhanced functionality include predefined document templates, simple to complex page layouts, title pages, automatic numbering (of chapters, sections, equations, figures, etc), and rich facilities for internal cross-referencing. syntax is easy to learn and well suited for integration with content generating programs, like R and database facilities. Anything in can be expressed in terms of text, commands and environments. Text: The basic document content. Between the \begin and the \end you can put other commands and nested environments. Environments can also accept optional arguments as well. Comments: When encounters a % character while processing an input file, it ignores the rest of the current line, the line break, and all whitespace at the beginning of the next line. % can be used to write comments, which will not show up in the printed document. Reserved Characters: The following symbols are reserved characters that either have a special meaning under or are unavailable in all the fonts. If you enter them directly in your text file, they will not print and will trigger a compile error (or do things you did not intend). Reserved characters can be used in a text document by adding a prefix backslash \. Quotation Marks and Dashes: Single quotation marks are produced in using and '. Double quotation marks are produced by typing `and ‘ ‘. A single dash is created, such as 10-15, is created using – –. An em-dash, such as —, is created using – – –.